Know Someone Who Loves the "Harry Potter" Series? "Hermione Granger's Unofficial Life Lessons and Words of Wisdom"
CUPERTINO, CA (PR Buzz) – October 31, 2018 – – With the newest Harry Potter movie, "Fantastic Beasts: The Crimes of Grindelwald," coming up on November 16, Harry Potter fans around the world are rejoicing and rekindling their love for the famous series. 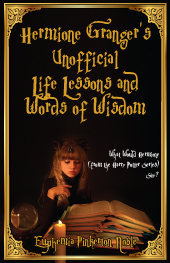 If you're a parent or a grandparent looking for a special gift to give to your children or grandchildren, "Hermione Granger's Unofficial Life Lessons and Words of Wisdom" is a book they'll surely love and treasure in their hearts. Hermione is, without a doubt, the brightest witch of her age, which is why she is admired by so many people. In this AHAbook, she shares tips and tricks to studying and how one can greatly increase their efficiency in education. As a Gryffindor, Hermione talks about bravery and courage and teaches us why we are bigger than our fears and greater than any obstacle. She speaks about the beauty of friendship and the value of family. Hermione advisesus about journeying through life and how to best handle the things that come our way. She definitely believes that dreams can come true if you work hard andbelieve in yourself. "Whether you're a fan of the Harry Potter series or not, you will surely love this book! Hermione Granger is one of the most relatable characters in the series — and the most intelligent one, at that. Learn what Hermione thinks about some of the most important topics in life, and you're sure to be left motivated and inspired for the rest of the day," says Mitchell Levy @HappyAbout, The AHA Guy Thought Leader at AHAthat™ (http://AHAthat.com). Check out the hardcover, paperback, and Kindle version of "Hermione Granger's Unofficial Life Lessons and Words of Wisdom" on Amazon: https://www.amazon.com/Hermione-Grangers-Unofficial-Lessons-Wisdom/dp/1616992816/. We also encourage you to read your book out loud so we can distribute the audio version on 23 audio platforms and incorporate it onto AHAthatRadio https://AHAthatRadio.com, where AHAs are streamed 24 hours a day. All content on the platform is curated by THiNKaha, which has published over 800 physical books and e-books. Visit https://AHAthat.com, and start sharing compelling content today for free in seconds.